Collect angle resolved spectra without the need to tilt the sample to non-destructively characterize ultra-thin layers using the Thermo Scientific™ Theta Probe Angle-Resolved X-ray Photoelectron Spectrometer System. New and emerging technologies rely on the engineering of the near-surface region of a solid surface. For this type of material, including self-assembled monolayers, surface modified polymers and semiconductor devices, it is essential that the composition of the first few nanometers is known with confidence. The Theta Probe, with a micro-focused X-ray source and parallel ARXPS analyzer, makes complex thin film measurements simple and intuitive. 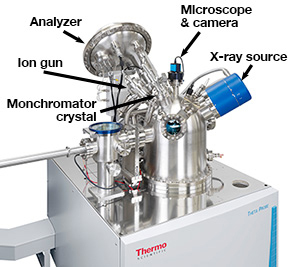 Theta Probe can be extended by addition of other analysis techniques, such as UV photoelectron spectroscopy, and a range of sample preparation options. Theta Probe XPS Instrument provides the unique ability to collect angle-resolved XPS spectra covering a 60° angular range in parallel and without tilting the sample. This feature facilitates the non-destructive characterization of ultra-thin ﬁlms. The Thermo Scientific Theta Probe XPS Instrument. The Theta ProbeXPS System collects photoelectrons using an electrostatic lens with a large angular acceptance (60°), which maximizes sensitivity and enables a large angular range to be collected in PARXPS measurements. The axis of the lens is 50° from the sample normal, enabling electron collection ranging from 20° to 80°. All angles are expressed relative to the sample normal when the sample is in the usual horizontal analysis position. The 180° spherical sector analyzer is ﬁtted with a two-dimensional detector in the output plane. The Theta Probe lens is unique because it can be operated in two modes: conventional mode, for spectroscopy when there is no requirement for angle-resolved information, and an angle-resolving mode. For survey spectra, the required energy range is too great to use the snapshot mode and the analyzer is scanned in the conventional manner. In the angle-resolving mode, electrons are dispersed on the detector in two directions, according to their energy and along the energy dispersive direction of the analyzer, which is conventional for a hemispherical analyzer. The electrons are also dispersed perpendicularly, according to the angle at which they were emitted from the sample. 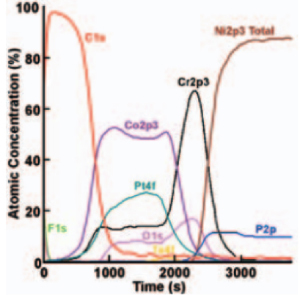 Therefore, angle-resolved XPS spectra can be acquired in parallel and without tilting the sample. The instrument collects photoelectrons over a range of 60°, which can be dispersed into a maximum of 96 angular channels. As a compromise between angular resolution and sensitivity, the data are usually summed into 16 channels covering the 60° range. The two-dimensional detector provides a means of multi-channel detection, having up to 112 energy channels arranged in the radial direction at the output plane. Therefore, a good quality snapshot spectra can be acquired without the need to scan the analyzer. This feature saves time, particularly when acquiring a large number of spectra, such as depth proﬁling or XPS mapping. The Theta Probe instrument is ﬁtted with a microfocusing monochromator, which is often its only radiation source. The monochromator includes a movable anode, which signiﬁcantly increases the lifetime of the anode. On stationary-anode instruments, the aluminum coating on any X-ray anode will wear with use and require replacement. The anode on the Theta Probe can be moved to expose a new area to the electron beam without breaking the vacuum. The Theta Probe defines the analysis area by the size of the X-ray spot (i.e., source-deﬁned SAXPS). The lateral resolution is 15 µm to 400 µm. Mapping is accomplished by moving the sample stage under the X-ray spot. Therefore, the size of the X-ray spot determines the resolution of the image. Producing maps by scanning the sample stage is less rapid than other methods but has many important advantages. The spatial resolution is constant over the entire imaged area. The detection efﬁciency is optimized, and the image is produced with the lens operating at its maximum transmission. The instrument transmission function is independent of position, which eliminates possible effects on the transmission function by scanning the lens-deﬁned analysis area. The X-ray energy and intensity are independent of position, which are not constant if the X-ray spot is scanned over the sample to produce the image. A large ﬁeld of view is possible. The maximum ﬁeld of view is determined by the range of movement of the sample stage, which is 70 mm x 70 mm for the Theta Probe. Other methods of imaging or mapping have a more restricted field of view. A spectrum can be produced at each pixel in the image. The spectra also can be processed in the normal way for maximum quantitative and chemical state information. PARXPS measurements are possible at every pixel, enabling overlayer thickness maps to be obtained. No other XPS instrument has such a capability. XPS map of oxidized tin. Spectra or PARXPS data can be derived retrospectively from any area in the map or even from a single pixel. Maps can be constructed following the application of advanced data processing techniques such as NLLSF, which enables accurate mapping of chemical states. Collection of angle-resolved data simultaneously with the spectral data enables thickness maps or sub-surface images to be constructed. The Theta Probe unique ability to combine mapping with PARXPS adds a new dimension to XPS mapping. The range of sample sizes that can be accommodated with the Thermo Scientific Theta Probe instrument. The alignment of the zoom microscope, sample and illumination on the Thermo Scientific Theta Probe. The Theta Probe XPS system has a fully motorized stage capable of ﬁve axes of movement with a range in X and Y of 70 mm and 25 mm in Z (height). The stage can accommodate a variety of large sample types. If sample tilt or rotation is required, samples must be loaded onto the sample holder, which has a continuous rotation with a tilt range of ± 45°. All axes of movement on the sample stage are motorized with the controlled linked to the Avantage data system, which can be used to control the sample position. 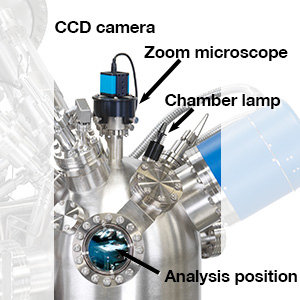 A zoom microscope is positioned immediately above the sample with its axis parallel with the sample normal when the sample is in its analysis position. The ﬁeld of view from this optical system ranges from 400 µm to 4 mm. The analysis position is accurately aligned with the center of the graticule when the image is in focus. To align a feature for analysis, it must be visible and in focus at the center of the graticule, which is accomplished by moving the sample using the tracker ball or pointing to a position on the optical image using the mouse pointer. A sample preparation chamber can be added to enable a variety of techniques including, ion etching, heating, cooling, fracturing, parking etc. The analysis chamber on all Thermo Scientiﬁc XPS instruments is constructed from 5 mm thick mu-metal to maximize the efﬁciency of the magnetic shielding. The chamber is pumped using both a turbomolecular pump and a titanium sublimation pump. 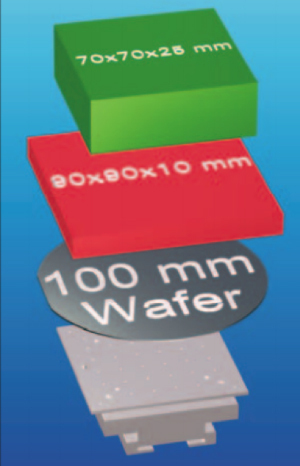 This arrangement enables the analysis chamber to achieve a vacuum greater than 5 x 10-10 mbar. The entry lock is pumped using a turbomolecular pump backed by a rotary pump. Differential pumping is undertaken through the entrylock, with all interlocking of valves etc. necessary to protect the system during venting of the entrylock automated through the Avantage datasystem. The Theta Probe speciﬁcations are deﬁned under typical operating conditions. The microfocus monochromator is operated at the maximum power appropriate for each spot size. Count rate scaling is therefore not necessary. The sample is placed on the normal sample holder with its surface horizontal and remains in the same position for both spot size and count rate measurements. When comparing speciﬁcations from different instruments, it is important to ensure that the conditions under which the data are collected are the same. An image of the channel plate output when the analyzer is tuned to the Si 2p region of the spectrum. 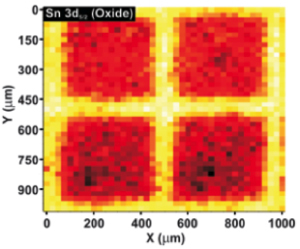 The sample is 4 nm of silicon dioxide on silicon. 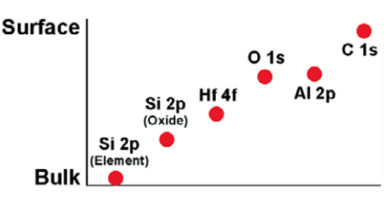 The elemental and oxide peaks are clearly visible but the intensity of the signal from elemental silicon decreases more rapidly with increasing angle than the oxide peak. ARXPS is being used increasingly to determine the composition and thickness of ultra-thin surface layers. At grazing emission-angle, XPS data are only collected from the near surface. At nearer normal emission, the information depth is larger. The radian lens spectrometer on the Theta Probe provides both energy dispersion and angular dispersion on the 2D detector. Both are collected simultaneously, enabling gngle-resolved XPS without tilting the sample. The simplest use of angle-resolved XPS data is to produce a relative depth plot. This shows the sequence of layers in a sample but does not provide thickness or depth information. A relative depth plot, derived from PARXPS data, showing the sequence of the layers in a multi-layer material. 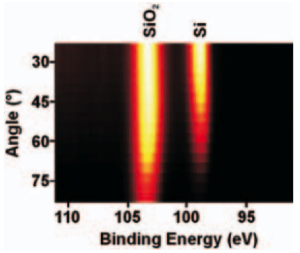 The layered structure consists of Al2O3 on HfO2 on SiO2 on Si. The sequence of these layers and the carbon contamination layer is visible. Data can be used to measure the thickness of a layer using the overlayer thickness calculator software integrated into the Avantage data system. The thickness of multiple layers can be measured using PARXPS. 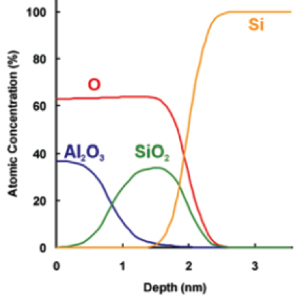 Comparison of ARXPS and ellipsometry for measuring the thickness of SiO2 layers on Si. Although the linearity is excellent and the gradient is close to unity, there is a 0.8 nm intercept on the ellipsometry axis. 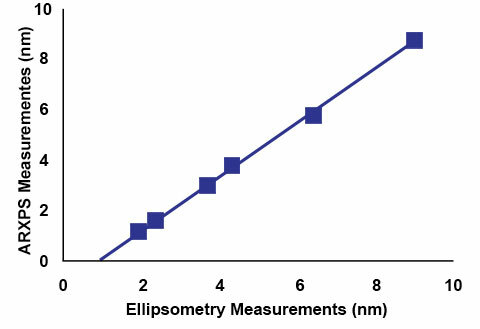 This is commonly observed in such comparisons and occurs because ellipsometry measures both the oxide layer and the contamination layer present at the surface. PARXPS, however, measures only the oxide. The contamination layer was formed at the surface during exposure of the material to air. The thickness of the contamination layer can also be measured by PARXPS, if required. A depth proﬁle constructed from PARXPS data. A method involving maximum entropy enables extraction of depth proﬁles from PARXPS data. PARXPS is a powerful technique for examining surface modiﬁcation of insulators. Using the Theta Probe, the sample does not have to be tilted so the charge compensation conditions remain constant. The analyst can be certain that changes in peak shape with angle are from the chemistry of the surface. Sputter depth proﬁle of a hard disc. For layers whose thickness is greater than a few nanometers, concentration depth proﬁles can be generated by sputtering using noble gas ions. The Theta Probe provides depth proﬁles from a small area with high sensitivity. Small sputtered areas ensure high etch rates and short acquisition times. The EX05 ion gun may be operated at high current for maximum proﬁling speed and at low energy (down to 100 eV) for optimum depth resolution. The low energy performance is enhanced by use of a ‘ﬂoating drift tube’ in the ion gun. Multi-sample sputter proﬁle acquisition enables unattended operation for maximum sample throughput. The data system includes target factor analysis (TFA), linear and non-linear least squares fitting (LLSF and NLLSF). These functions are fully integrated and ensure that the maximum possible chemical information is extracted from every proﬁle. Azimuthal rotation of the sample during sputtering minimizes the development of sputter induced topography.